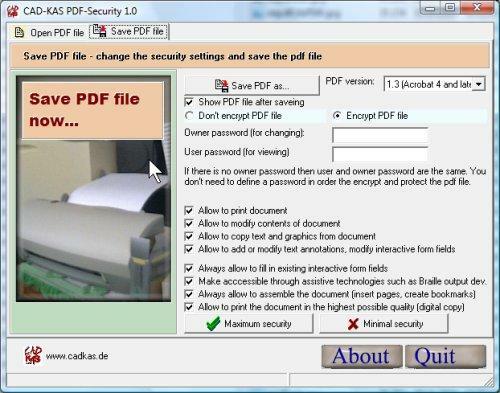 Protect PDF files against unauthorized access and encrypt them! The program limits the access to PDF documents. You decide if a PDF file can be printed in the Acrobat Reader or if somebody may copy or edit the text. You can decide if the user have to enter a password in order to view the file. It is also possible to decrypt PDF files. If they are protected by a password you have to know the password in order to decrypt the file. If you want more protection against text copied out of your file you can consider to convert all text objects into pictures with PDF 2 ImagePDF. If you only need to unprotect pdf files you can use PDF Password Recovery. 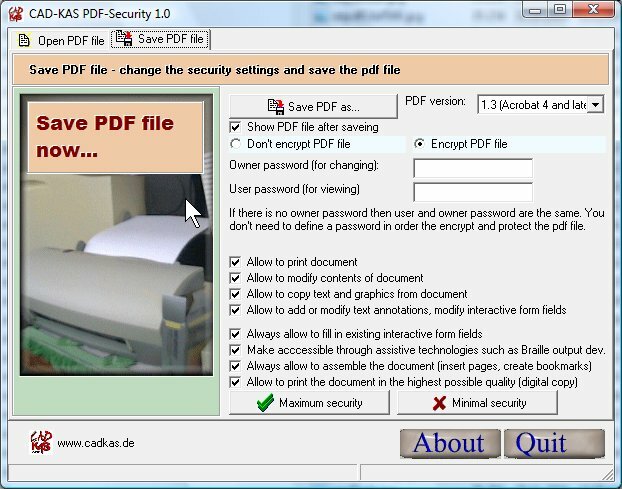 All the functions of PDF Security are also available inside of PDF Editor. PDF-Security has been awarded with the 5 stars "cool" award by software directory www.Softizer.com. PDF-Security was rated with 5 stars by software directory BrotherSoft.com. PDF-Security was rated with 5 stars by software directory topshareware.com. PDF-Security has been awarded by www.soft32.com with 4 stars. PDF-Security was rated with 4 stars by software directory softpicks.net.